“Are we doing enough to protect our dark skies?” That’s the audio lead-in used for this mini-documentary on KSL-TV. 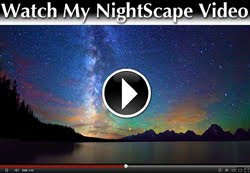 John Hollenhorst (KSL's Science & Nature Specialist) and videographer, Ken Fall followed us (Charli, Teresa, Joe, Michael and I) around this past March in Bryce Canyon National Park at 3:00 AM. It was about 20ºF, and we’re all bundled up, so don't expect a fashion show! 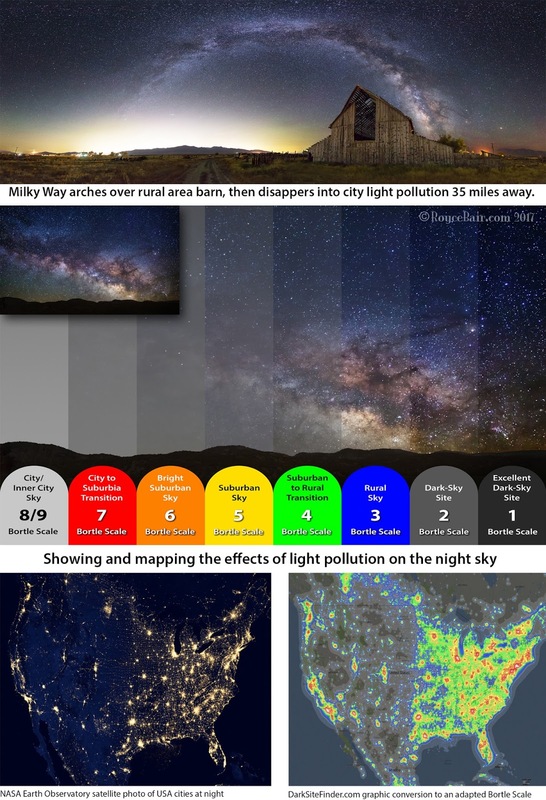 But you will see some beautiful Milky Way skies, with stunning western foregrounds; and you'll learn how the park service and some cities like Flagstaff, AZ are working to protect our dark skies from light pollution. Finding Darkness is a quest I am on to help find and protect our dark skies. These are places where we can still clearly see the night stars. My goal is not to be an alarmist about light pollution, but to promote the use and benefits of dark sky areas as sanctuaries for creativity and solace —areas where we can remove the noise from our busy lives, to think, dream and be inspired. A Santa Fe astronomer has said, "...as light pollution spreads, we are slowly losing one of the oldest and most universal links to all of human history." As late as 1889, Van Gogh was able to experience and paint his famous “Starry Night”. If he were alive today, there would be nothing in the night skies over Saint Rémy, France to inspire him, as the Milky Way can no longer be seen from there. 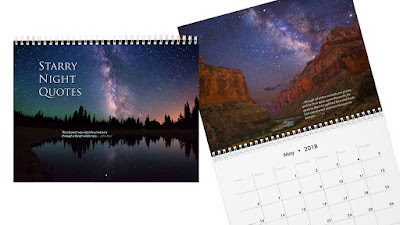 Starry Night Quotes is a 2018 wall calendar I am publishing to beautify your home or office and help people become more aware of the importance of preserving our dark sky areas. You can learn more about dark sky sanctuaries by watching or reading the KSL documentary and by visiting the International Dark-Sky Association (IDA) website. $5.00 from every calendar sale on my Etsy website will be donated to IDA. "Starry Night Quotes" is a 2018 wall calendar with emphasis on preserving our dark sky sanctuaries. A vertical Milky Way and strong airglow. Photographed at Jackson Lake, with the Teton Range in Grand Teton National Park. 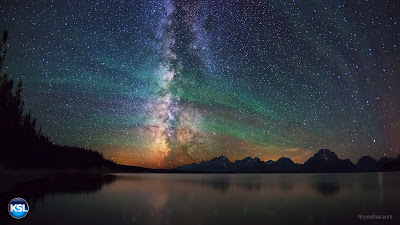 One of my images featured in the KSL mini-documentary about preserving our dark skies. Watch it here: Here's the complete transcript and the 5-minute video of the program that aired on April 25th: Dark Skies: 'Half the park is after dark'. A worthy project, well worth your involvement, Royce.